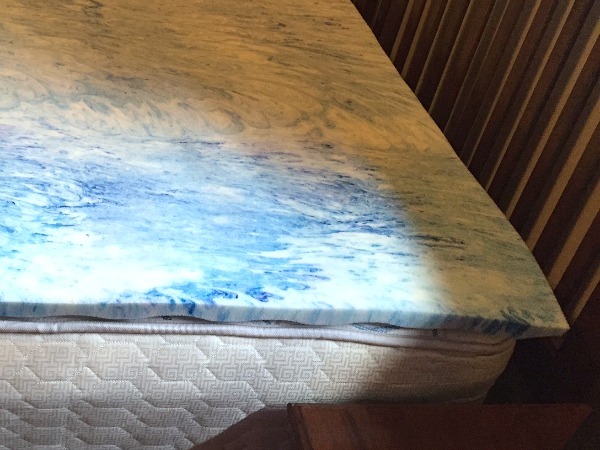 Our sagging mattress is terrible; how about yours? This mattress has been terrible since shortly after we got it, the place we bought it from is out of business, and this is the third terrible mattress we’ve gone through in our marriage so far. You know how these expensive mattresses are just not lasting like they used to? Or maybe we’re just very poor at picking them… and ours developed horrible indentations on each side where we sleep. So both MashupDad and I often woke up with back pain and slept poorly because we were sleeping in a hole — not to mention that it’s really depressing to spend all that money on a mattress, and then find that it feels nothing like it did in the store within just a few weeks. A new mattress isn’t in the cards quite yet because of the long list of other things that need replacing (we have a refrigerator and car that are on their last legs, oy!). So I thought I’d update this original post from almost three years ago with a list of what we have tried to help fix our sagging mattress on the cheap (without having to buy a new one), ordered from best to worst. How to fix your sagging mattress — or at least make it much more sleep-able! So here’s what I’ve found to work the best, after a few years of dealing with our sagging mattress. I recently picked up this memory foam mattress topper from Kohl’s — which has great and well-deserved reviews! It’s a little pricey when not on sale, but this is Kohl’s, guys, so if it’s not on sale today it probably will be soon. I bought mine at around $25 after a sale + coupon code, and will watch for new deals to pop up for you guys. It’s kind of neat how this unrolled to fit a king-sized mattress, but when I first opened the mattress topper I was afraid it would be too thin to work. Luckily, I was wrong. It helps quite a bit, and the mattress pad and sheets still fit nicely over everything. In all honesty, you can still definitely tell that the indentations are there, but it does a nice job of evening them out more and getting rid of some of the lumpiness — and the bed is much more comfortable. We’re sleeping better, so it’s definitely worth more than my $25-ish sale price, and highly recommended! After reading a bunch of reviews online, we also tried the Mattress Helper a while back. 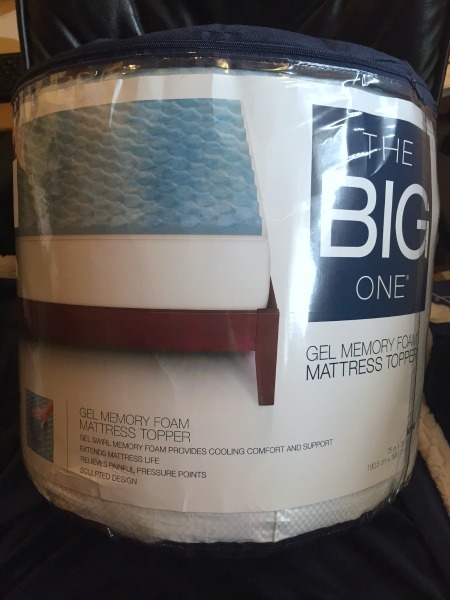 It was at the time on sale at Kohl’s, plus a coupon code, plus Kohl’s Cash back — so again, watch for deals on the Mattress Helper there if you are interested in trying it out. The Mattress Helper did actually help lift the mattress back up along where it was sagging, but didn’t bring it all the way back up. Our sagging mattress problem got better after placing the Mattress Helper under the places where the mattress is sagging, but it didn’t entirely resolve the issue or our poor sleep issues. It’s possible our mattress was just sagging too much for this to work, but the Mattress Helper is likely a nice option if your sagging issue is a bit less or your mattress is just too soft. We also still have the Mattress Helper under our mattress and use it in conjunction with the memory foam mattress topper, so they play really nicely together. A while ago I was poking around on Amazon and started reading the reviews of this Pinzon Basics Overfilled Plush Mattress Pad. We needed a new mattress pad anyway because our old one was tearing at the corners, so I bought it. I will say that it’s a really nice mattress pad — it helps smooth out the smaller lumps, but doesn’t honestly do a lot for the sagging problem. I’d recommend it for a lumpy mattress, a dorm room mattress, or if you’re just looking for a nice new mattress pad. 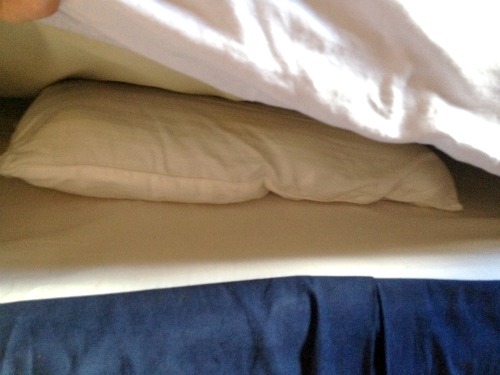 Lastly, here’s the most temporary fix for a sagging mattress: Take two cheap bed pillows. Lift up your mattress. Shove one under each side of the mattress, right under each indentation. Put the mattress back down over the pillows, lie down, and see if it feels like the pillow is in the right place. If not, lift the mattress back up and adjust as needed. Here, I used two old bed pillows I already had in the house, so it cost us nothing. We did sleep more comfortably for a few nights, but then the pillows got smushed down to a pancake so we were back to square one — not a long-term solution. Note: If you use the firmer gel pillows, this fix will work better and last longer! What ideas do you have for fixing a sagging mattress? Let me know how any of this works to fix your sagging mattress, if you give them a try yourself — I’d also love to hear any other ideas, or tips for buying a new good mattress that will last, and check out some other ideas in the comments from the original post, below. hope it keeps working for you!! Quality Sleep Shop in Countryside is THE place to get a new mattress. They are made in house and the price is not ridiculous. We got our King Size mattress in 2008 and it is like brand new. They also stand behind their product. Family owned and operated. I would rather spend a little bit more and get a good product AND help out a family business. Totally worth it. I just heard read about that place the other day at themattressunderground.com and they were given very high marks. Do you know if they will deliver,set-up and remove the old bedding? Thanks. We have the same problem…but started going to the chiropractor for our backs. She said to NEVER buy the pillow top mattresses.She has more people coming to her now with that mattress than ever. Also a heads up that Sams Club has a lifetime guarantee on mattress sets. We returned ours and got a gift card with the full amount. I read somewhere that in the years since China has taken over manufacturing, most mattresses are now being made so that only one side is usable and you can’t flip the mattress any longer because only one side is covered — even the well-known brands are doing this. Is that the type of mattress you have, Rachel? We bought our mattress in 1997 before manufacturing was taken over by the Chinese and it’s still fine. Seems like outsourcing has been going on forever, but 16 years ago you could still buy something that wasn’t made in China. A good mattress used to be guaranteed for 20 or 25 years. We’ve been married for 36 years and we’ve only bought two mattresses so far. But we’ll need a new one eventually and I hate to hear that the quality has gone that far downhill. Well, I have been miserable for almost 2 years with my new mattress sagging. You are not suppose to flip it. I flipped it the other day. I put on a thick foam topper and have a thick mattress pad ordered. It is working great….no more sagging. It is quite comfortable if I have to say so myself!! I flipped my “no flip” mattress also! It was really hard but worked great for approximately 3 months, then it too started breaking down. Thank you for saying this. Totally agreed. I hope you agreed with what Charles_M said because I totally agree also! Not racist, just facts. Did China “take over”? Or did the US & other countries find a goldmine in a poor, over populated area & exploit it? Agreeing with Charles here. When Chinese factories make things for American companies, they’re making it to the company’s specifications. Don’t blame the workers. Blame our money hungry companies that pay starvation wages and have their products made to be crap. And they make them this badly no matter where their factories are these days. It’s the CEOs of the companies that I’m blaming, not the poor people who are stuck making their junk. Idk about mattresses being made in China. I sold them about 5 yrs back and personally went to a Serta factory in Summit, Il?, Simmons in Janesville WI and Sealy was somewhere local as well. I do know that you usually need to replace both the mattress AND box spring, even if the box spring looks OK it has had the same amount of wear as the mattress and it will not support the new mattress like the new one you try out in the store. Thats why you can get any warranty when you buy just the mattress. If you just bought it You should be able to get a new one or a full refund. Even the old ones are prorated up to the time frame listed on it like 10, 20 yrs. etc. And the warranty is with the manufacture, not the store you bought it at so you can usually get something towards a new one. HTH! Thanks for the tip Rachel! I’m definitely going to try it. We bought our mattress a little over a year ago. For the last 8 months or so we’ve had indents in our bed. We called the company we bought it from and they told us they would send someone out to measure the indents. (?) If the indent was 2 inches, they would replace it. It’s pretty close but not quite 2 inches. Figures…. We had the same thing happen. Ours was over 2″ so they sent us a new one. The problem is that the new one is the same as the old one and now has indents too. Since it’s over a year from the original purchase they won’t do anything about it. I’m going to try out this pillow suggestion tonight. We purchased a well-known name brand mattress and after a week noticed body depressions and neither the company that sold it to us nor the manufacturer will stand behind the mattress. That is $966.00 thrown away and now we have to find another mattress that won’t give us debilitating back pain. We’ll be looking for a local, family-owned mattress company in Oklahoma City that will stand behind the products they sell. I am on the memory foam mattress bandwagon! We had an old, and cheap mattress that was about 7 years old. Both our backs were killing us. I had issues with my arms hurting and going numb at night. Husband had started sleeping on the couch. So, we went to our local Menards and picked up a mattress from there. Took a try at memory foam, and it is the best money ever spent. It took some getting used to (about a week, I totally regretted buying it for a while), but now, it’s awesome! It also seems easier on my allergies than the old mattress. Costco….I’ve actually returned a mattress because it started to sag. I love Costco. they have this temperpedic mattress now…I think you put it on a box spring. anyway, go buy it. try it out for 1 week, 1 year…if you are not satisfied…return it. they stand behind any product that they put on their floor. The sleep number bed isn’t for everyone but we LOVE ours. We had a more basic model that was great, and then we upgraded to one of their mid-range models in a king size and it’s even better. We had the first one about 6 years (and resold it on craigslist for $150, incidentally) and this one is still going strong at 4 years–absolutely no noticeable loss of quality. I know some people don’t like them but for us sleep number is amazing and well worth the expense. I on the other hand can’t stand memory foam. I don’t like feeling like I’m sinking in, and I feel like I get way too hot on the foam. I’ve slept on a few and was miserable the whole time. Ick. Dani, When I get the money will you meet me here in AZ, lol! Ima hurting! No membership…? We swear by our select comfort air mattress. We even bought one for our daughter, too! Adjust the firmness any day to any level you want. But it also spoils you for any other mattress! It was barely more than a Sam’s Club mattress, and is now 8 years old with no real wear! Rachel, how long has the topper lasted thus far? Not super long — I will come come back and update the post yet again if it fails us or when we eventually bite the bullet and get a new mattress. 🙂 I’ve seen them at Costco for a pretty reasonable price, too, but can’t comment on the quality there. I’ve been thinking that we should buy 2 twins instead of one king size – and cover it with a mattress pad. My husband likes a softer mattress, whereas I’m more comfortable with a firmer one. Our backs are stiff and hurting in the morning, but buying a new mattress is not a real option right now. Too many other projects around the house…? Is that why people buy the sleep number beds? Jen above, if you are reading this, can you comment? Yep, that’s a major reason we like sleep number! My back hurts if the mattress is soft but my husband prefers it ridiculously soft. Sleep number is a great solution to that problem. But, they’re really expensive. They do offer great financing plans, and we’ve found the mattresses last much longer than conventional mattresses, but that upfront cost is big. I’ve had sleep number bed for years and LOVE it!!!! We even used an old one to Murphy Bed…. think it’s all about personal preference! I wanna know how come I can fall asleep on the couch, yet go to bed in my $1000 mattress and still toss and turn!? We upgraded after almost 25 years living with the indents and buying a THICK topper from Sam’s to get us by, and I am still not a “happy camper”. We bought locally again and they told us if we were not happy, they would exchange it for any other mattress. Well after sleeping on it for over a month when we called them they decided not to honor that deal. So much for supporting the local family business! I wish I would have just got one at Sam’s now. We had to put the old topper back on it to be able to sleep in it since it was like sleeping on the concrete sidewalk. We do have that 2 inch guarantee for 10 years, but I really doubt the indents would ever get that big. It will probably measure 1 7/8 inches! This was Christmas before last and we are just living with this now. Get this; they told us to jump on it and walk around on it to break it in! I really would like to know the secret to getting a mattress you love! I would like to lnow that secret to .i had a Sealy Posturpedic for 35 years. It was the bezt bed. My kids wanted it. I ginally went and spent about 12 hundred on another Posturepedic Hybrid.. I did not get the stand that raises your head or legs..
At first I loved it. It is very high, no good. Dented already after a year. I arporosiscant afford another bed . I am now sleeping on a couch bed that is sagging terriblebut more comfty then my bed. I have memory foam, fluffy covers, you name it. Now have osteoporosis so they day be careful getting in and out of bed. This world isnt fair. Mattresses are a joke. The box on the bottom is just that a hollow box. Really?? I was going yo put it on the floor and found that out.nothing lasts, nothing works long you gotta laugh or you cry. C2 Sleep Number. Worth every penny. I bought the Pinzon overfilled stuffed mattress pad for my daughter at college. She thought it worked great on the hard as a rock mattress she had a school. However ,when she came home I had to send it to the dry cleaners!! You could not wash it in the washing machine which was a bummer. Oh that is great! i will do that! Our washing machine died last week. We bought a Speed Queen which is what laundromats use. I hope it is the last one we ever buy! LOL! The repair man told us it’s the only one he recommends any more and says it should last us 20 years! Nice! We just bought a new washer last summer — it’s really depressing how quickly big purchases seem to wear out anymore. Anyway, hopefully that will work for you — Mine is still in great shape with no tears or anything and I’ve been washing it in mine for a while both in our old front loader HE machine and our newer top loader one. Is there a reason you went from a front loader to a top loader washing machine? They always say how much water and energy you save on a front loader. I think our top loader might be on it’s last legs, so any suggestions about types of machines is appreciated. I will NEVER buy a front loader again. The door seal molded, no matter how often I cleaned it. It smelled no matter what I did. And I don’t think the clothes got as clean, especially after the first year or so. I did get an HE top loader without agitator, but never again with the front loader. Speed Queen are the best out there now, least amount of problems. 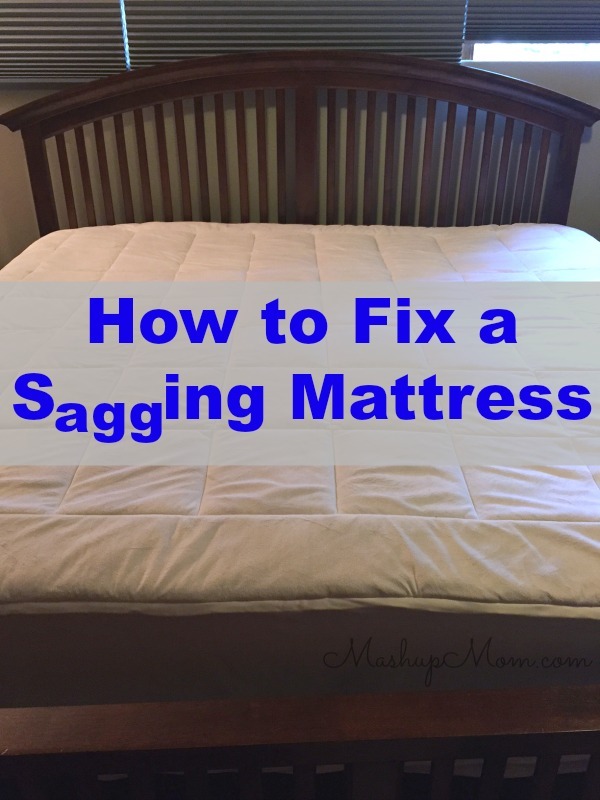 I was reading about the sagging mattress solutions at frugal living mom. It also suggested the pillows under the mattress. I’m going to give it a try. I don’t know of many people who can just go out and buy a new mattress. Plus, from the comments I was reading at the other site, it doesn’t seem to help even if someone has the kind of money it takes to buy new. I will find something around here today to put under my mattress. Thank you. These are some good tips, we used a memory foam mattress topper. That seemed to work for a while, and then a spring popped through so we figured it was time for a new mattress lol. Thank you from Mattress Helper! There are some mattress brands that still offer 2 sided mattresses. Curious question: has anyone ever tried to use more than one mattress topper at the same time on the other side to kind of create your own 2 sided? And flip like we used to do? Might not be quite as comfortable, but it might add some time to the useful life of the mattress. I have a dented pillow top matress and have done the “flip to the non padded side and add an organic wool topper”. Did the trick. I’m thinking about cutting out numerous carpet remnants in 6 inch wide, mattress length strips and stacking these across the boxspring according to some arcing mathematical function such as a catenary (most likely), parabola etc. with the x origin being the crosswise center of the mattress of course. This approach should be easy to fine-tune. Old mattress springs will have lost a lot of their k (modulus) over years of repeated compression cycles. Lol Phil, that was way too much algebra or physics or calculus or whatver it was for me…lbvs I think I’ll just try the 2 pillow option first but for now I’ll just continue to read the comments and try what others have said works best. If that doesn’t work I may try to figure out your equation! Our first set was New England and we had it about 20 yrs. Then we got a set at Darvin’s. It had a 10 yr non prorated warranty. At yr. 9 a metal rod protruded out the side. I contacted the mattress company. The first thing they asked me is if I removed the “do not remove” tags because if I did the warranty was voided. Then they asked if there were any stains – even just one pinhole size dot of ink voided the warranty. I sarcastically told her that we didn’t sleep on them – they were on display like in a museum. I complained and Darvins sent out a “mattress inspector”. His report indicated the mattress had “excessive wear” and they refused to honor the warranty. I felt like Rip Van Winkle. I would never buy anything from them ever again. Now I buy at Macy’s.- they stand behind what they sell. I’m about to have my third mattress set in 8 yrs. The first set had a spring issue. The second a metal rod thing again. And now sagging. Macy’s sent out a mattress inspector each time and ruled in my favor. I can’t understand why these manufacturers don’t care about quality. Each time I get a new set Macy’s refunds the defective set and I purchase a replacement. They’ve never been under $1500. They’ve all been Serta’s and Sealy’s. What’s happened to pride and workmanship in products? Yes Joanne! I totally agree, things just don’t last as long as they used to! Things that were supposed to last Twin to 20 years now may only last 5 to 10 years. There is no pride in quality anymore it’s all about the almighty dollar and how things can be made cheaper and faster. That being said on my search to fix my saggy mattress until I can afford a new one I may just have to face this fact. I may also, when ready to buy a new mattress have to be aware that they just will only last 3 to 5 years from what I’m reading. Consumer Reports reported on mattresses in their February issue. There were a few mattresses that they really liked that were under $1,000, but they were brands tha6 I had never heard from. They also liked Sleep Number and some of the Ikea mattresses. I don’t think they were big fans of pillowtop mattresses. I went to Walmart and got several thick folded up boxes that they sell. I like it better than plywood because it has some give in it. It’s cheap enough to change often if needed. after looking at the sagging mattress fixes on the web, generally in the $30 price range, I nearly bought one…inexpensive fix! I looked at mattress toppers and wrote two companies who sell them, both told me that mattress toppers would not solve the problem. When I thought about what they were saying, i could see that it made some sense…the mattress will still sag, the topper will sag with the mattress. So I was ready to spring for the Mattress Helper Sagging Mattress Support at target for about $60, when I had a thought. Those sagging mattress helpers are just a rigid structure a couple inches thick. I had used rigid pink foam insulation for a project at my house and had some good sized pieces left over. The original sheet was 1.5″ thick by 4′ by 8′ and cost about $20 at home depot. I measured the depression in my bed and cut a rectangular piece to fit. It worked like a champ! I have used this solution now for 5 months and it’s working just as well as the first night. As a side comment…I don’t think conventional mattresses are made nearly as well as they used to be. You cannot flip the one I purchased and it lasted less than 4 years before i started getting back aches. how do you measure the sag? I have had my mattress (heavy as crap and not flippable) for 12 years. I am 30 and still live at home and therefore LIVE in my small room so I LITERALLY sit in the same spot of the bed ALL day and therefore it has such a CRATER in it I can’t take it anymore! Thing is I am a single mom and broke as dirt but also moving in with my boyfriend in the next 6 months. We will use his perfect comfy brand new bed when we live together so there’s no point in buying a new mattress now! I mean who would buy a used mattress afterwards so I could get my couple hundred spent back? I tried pillows, pieces of wood, bed helper, even bed boost. I currently just have two 2 inch thick memory foam toppers UNDERNEATH my mattress & it’s as good as it’s gonna get. Except the mattress bounces with every movement due to it being uneven and overall I literally have to climb up into my bed because it’s as high as my waist. It’s a size full. I have so many issues already with pain and its only getting worse. SOMEONE HELP! i can not believe all the comments about sagging mattresses! i bought a temperpedic $850 non foam mattress and after a month ,,,sag! i weigh 110 lbs and sleep in the middle. such a hassle trying to return or get credit for. seems like they dont want to stand behind the product….just defend it! PLEASE hear our pleas mattress makers and go back to the way they are supposed to be made. Like others,,,we had a mattress for a good number of years..15-20..we were able to flip it. well mattress makers figured that out real quick and made them non flippable. I am so discouraged with this whole sham the companies have going on….wish we could take them to court! I may try the attorney general for help…thanks for all the tips. I wil try the pink foam idea! We had a sagging problem in the middle of our mattress. Our mattress was a queen sized pillow top that we bought about a year ago for $600+. As such I wanted to avoid having to purchase another. I looked on here and saw the mattress helper and considered that as an option. Come to find out the thing costs $75. Being a DIY’er I decided to save my money and recreate the mattress helper with 2×4’s. I cut 10 pieces 20 inches wide. And nailed them together with some leather strap I found at an art store. I nailed/spaced the pieces evenly at about 48 inches in length all together, placed it under the mattress and we successfully solved our problem for less than $10. Took me 30 mins to make. Hi Ray! Could you please post another description of the support that you built. I’m sure it makes sense to most people, but I got lost at 48”. You cut 2×4’s into 10 20” pieces then connected those 10 20” pieces together with leather strapping……right so far? Then, what did you use in 48” lengths? Obviously I’m confused, but I am pretty crafty, so I think I can do this if I know what that last step was. Thanks so much! We have similar problems with 2 different mattresses. One has valley’s down the sides and the other is down the middle. I have yet to do this on either of these mattresses but in the past I have used a thick (3/4″) piece of plywood on top of the springs and that has helped. Plywood is cheap too. In the range of $15-$20 for a 4′ x 8′ sheet. For the bed with the sag down the middle I’m thinking about cutting the plywood in half lengthwise and stacking it down the middle under the mattress. Im a student and I cant afford a new mattress and Ive been suffering due to it sagging. I finally looked up what could help before I bought a 100 dollar mattress topper. Im so glad I found this! Threw some pillows underneath and viola! THANKS! This is great stuff. I ended up taking a couple of ideas and combining them to fix my saggy twin bed. First I put a thin sheet of 1/4″ plywood underneath. This helped but the mattress was still sagging just a little in the center. So I put something underneath the mattress on top of the plywood, but instead of pillows, I put a couple of 1-inch thick trade paperbacks (8.5 x 11″) side by side in the affected areas. Now it’s perfect!!! The paperbacks were actually two books about Hollywood stars. So yes, I am now sleeping every night with movie stars in the same bed! Ha! My parents use plywood under their mattress. Our big name brand mattress lasted less than a year. 5 years later, i have so many knots in my shoulder muscles, it’s causing migraines. I’m going to try the gel pad idea to help us until we can get a new one. I was told by a mattress pad company that a mattress pad probably would not be a good solution…the sagging part will still be sagging, just an inch or two higher than before. What I did was roughly measure the “sag area”. Then I got a piece of rigid foam insulation (its two inches thick and about 4’x8′. Cost was about $20 at home depot. Then I cut out a piece that was about the size of the “sag area” I placed the insulation on top of the box spring, in the area beneath the sag. By doing this, the “sag area” is raised two inches.